We’ll bet you’ve seen commercials on TV or YouTube where people are paying for everything from coffee to cab rides with a mere swipe of their smartphones. And there you are, with your bulky old wallet full of credit cards or—heaven forbid!—cash. No need to feel old-fashioned, though. Mobile payments are catching on, but you may have questions about ease of use, security, and availability. Read on for a primer on mobile payments, and learn more ways you can use your smartphone to simplify your life. Many mobile payment systems—like Apple Pay, Android Pay, and Samsung Pay—use Near Field Communication (NFC) technology. You add a credit card to your smartphone, and then an NFC chip in your smartphone sends a transaction code to the store when you bring your smartphone (or smart device, like an Apple Watch) within 4 in. or so of the NFC reader. 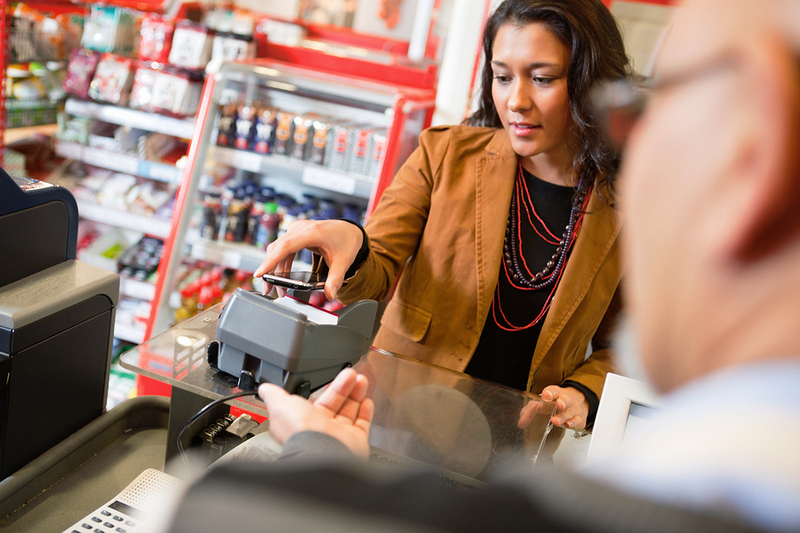 Hundreds of thousands of U.S. stores have already incorporated NFC readers. (Many did this when they switched to new terminals to read chipped credit cards.) Major mobile payment platforms don’t send your credit card number, though—they use a one-time transaction code instead. That can make mobile payment even safer than swiping with a magnetic stripe card. If you have Samsung Pay, you can use NFC to pay with enabled phones, or even pay with a regular magnetic stripe reader, thanks to Samsung’s February 2015 acquisition of LoopPay, which figured out how to use magnetic stripe readers to send payment info without actually swiping a card. Nervous about paying with your smartphone? If you’re using a major NFC-enabled system, you probably don’t need to be. Many mobile payment options are more secure than old-fashioned mag stripe transactions. If you have questions, read the information provided by your phone manufacturer or payment provider. What you do need to be careful with: Your smartphone. It was always a good idea to include a passcode or fingerprint scan to allow access to your device, but now it’s essential. And make sure you’ve enabled your phone’s “find my phone” feature—so you can locate a missing smartphone quickly, or wipe it remotely if you ever need to. In the end, mobile payment systems are here to stay and the convenience of it all is actually something you can begin to embrace.